After a season average that was 30 points below his career average, the new Saint had a lot of upside at that price. Hannebery represents plenty of value when you look at his price that is based on his 2018 average. Looking back over his career, at the Swans he averaged 88.4 Fantasy points in his 186 home-and-away games dating back to his debut year in 2009. In his second year he went bang, averaging 80.5 before taking a big leap in 2015 pumping out his best Fantasy season with an average of 110.8 from 22 games. To prove this wasn’t a fluke, Hanners went at 108.1 again playing every game the following year. In these two seasons, Hannebery averaged more than 30 disposals and five tackles per game. Tackling has been a big part of his game for the second half of his career. In 2017, Hannebery’s average dropped to 94.4 which some niggling injuries – and a stint off the cans – was to ‘blame’. This time last year many coaches thought he was value considering he was up to 15 points under-priced. Tackles were still there, averaging more than five a game, but it was his disposals that dropped to 24.8 that hampered his scoring. Hannebery spent more time out on the wing playing an outside game rather than being at centre bounces. In 2018, Hannebery’s average was 59.8 from his 14 games. Throughout the year he only scored more than 80 twice with an 82 and 92… on the other end of the scale, he posted four scores in the 40s. This season average was Hannebery’s worst since his debut season a decade ago. The last paragraph probably reads like it should be in the next section, however, it is the reason Hanners should be considered for Fantasy Classic this year. Not often you find a player priced more than 50 points below his best; especially one that has been elite and in the mix as a first rounder in Draft only a couple of years prior. Can Hannebery get back to his best… or even to that 90-odd average to be worthwhile as a stepping stone. In order to make some cash over the opening few rounds, we’d want Hanners to hit around the 90 mark to do his job. With him doing it just once last year, it is pretty easy to think that you just don’t want to go there. It has been well documented that injury struggles in his last couple of seasons – including groin and calf issues – have impacted his game and in turn Fantasy scores. Disposals numbers were at a low last season, averaging just 18.3 for the year to go with that sub-60 Fantasy average. On arrival at the Saints, all was looking pretty good. He’d returned to training before he had to and was working well up until Christmas. That was until some ‘hamstring awareness’ meant he had some scans. On return, he has been working in the gym over the last week or so, but from all reports, he will still be playing JLT. The other major factor on Hannebery improve his Fantasy numbers to somewhere in the vicinity of yesteryear is his role. With a few midfielders floating around at the Saints – and a few more expected for that elusive ‘more midfield time’ – a bit of a watch over the JLT will be important. He’s a midfielder first and foremost. I don’t expect Hanners to be playing inside 50, he’ll either be on the wing or back in the guts winning the ball, but it is important to be sure of his place in the side. JACK – Should be better than a Jack rating, but we have to keep expectations low… and possibly realistic. No, Hanners isn’t going to be the 110 man we saw a few years ago but he’s definitely better than the 60 he’s priced at – substantially better. I’m backing him in to average over 90 and this would see him make around $200K over the first 6-8 weeks and be in a prime position to upgrade. It seems to be a low-risk investment for me as a midpricer. That said, a fair few things need to go right. We won’t want Hanners to be underdone going into the season – so seeing one, if not two, JLT performances will be a must. Any sign of him moving like he so horrifically waddled around last year would be enough to put a line through him. There’s unmistakable value in Hannebery this year, but not without some risks. It’s going to be a big part of decision making over the next two months as to which midpricer, if any we roll with in the midfield. What does Hannebery need to average for your to select him? 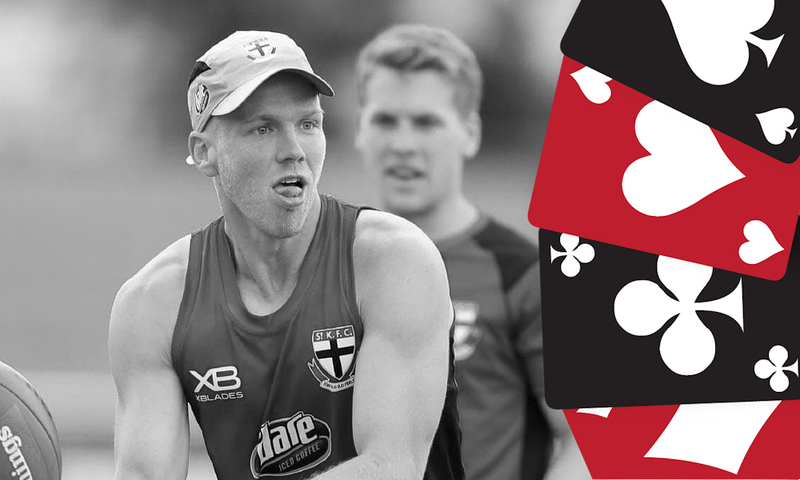 FOLLOW ME ON TWITTER: @WarnieDT for all thing AFL Fantasy (and more). Got something to say about the deck? Use the hashtag… #DeckofDT. Would it be silly to start with rocky? Not at all…. I’m actually trialling him at M4. Not sure how his shoulder is doing but surely more TOG this year especially in the mid or Mabye the wing or half back. to me he is not a forward like his junior days. I’m sure ROY will have more info about him leading up.